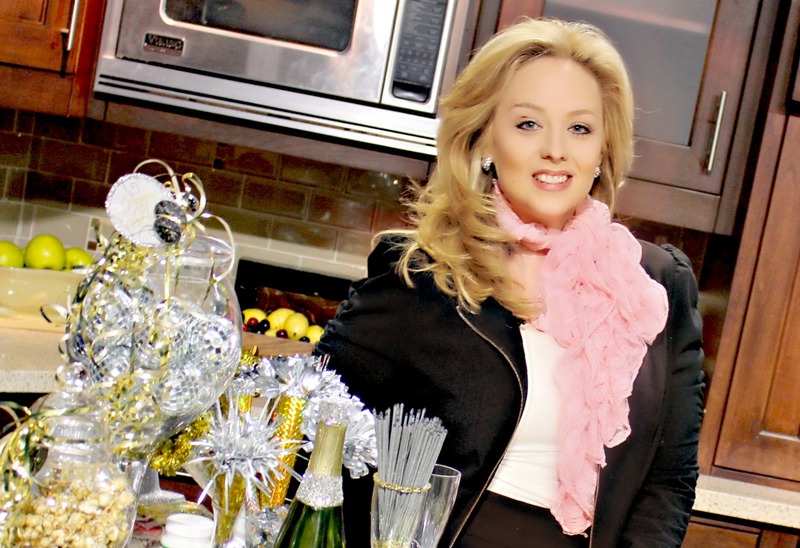 Click here to see my New Year's Eve Spot on T.V. Lets talk about food! A party that requires tiny forks and cocktail picks is a great party. This menu will be made for tiny forks and cocktail picks! With the following Make sure you put plenty out. There will be however a few smart people. They utilize their cocktail picks with a tremendous amount of trickery. The smart ones figure out quickly take two at a time...SMARTIES! This is just about as easy as it comes...crock pot city! Don't have enough crock pots? Barrow from friends...they are always happy to help when they know they will receive goodness at a party! There are lots of recipes for both "little smokies" and sweet meatballs on line. I like to serve these little guys with a little extra kick! Put it in a crackpot and walk away! To be perfectly honest I really don't have time this year to make my own meatballs. My mother would be so disappointed! Store bought meatballs are unacceptable to my mom. Love you, MOM! You have thought me well...I just don't have time! I have no guilt! I will kick up store bought meatballs with killer sweet and spicy sauce though. When I use store bought meatballs I do a few simple steps to them before using them. I put the frozen meatballs single layer in a pan and fill it with enough water to cover 1/2 the meatballs. Let them come to a boil on med. high heat. Boil for several minutes. This thaws them as well as cooks off the majority of the unnecessary fat they contain. 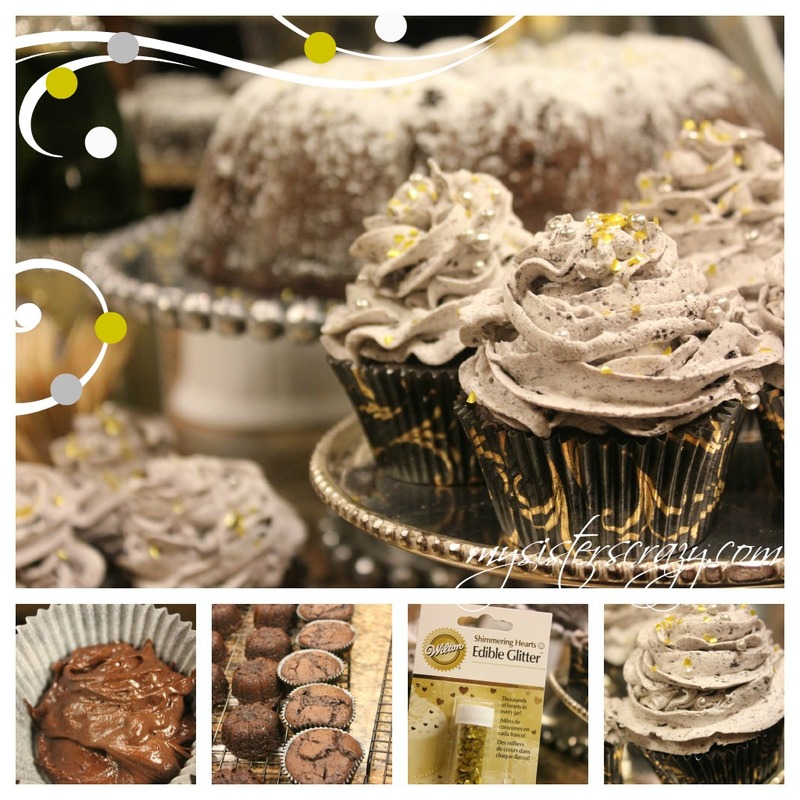 I always use fresh lemon when using store bought items...it helps perk up the flavors. Lemon taste fresh, I love it! I like to use the little smokies because they can be warmed quickly in a pan and transferred to a crock pot to keep warm or you can put them in a crock pot on low for several hours. 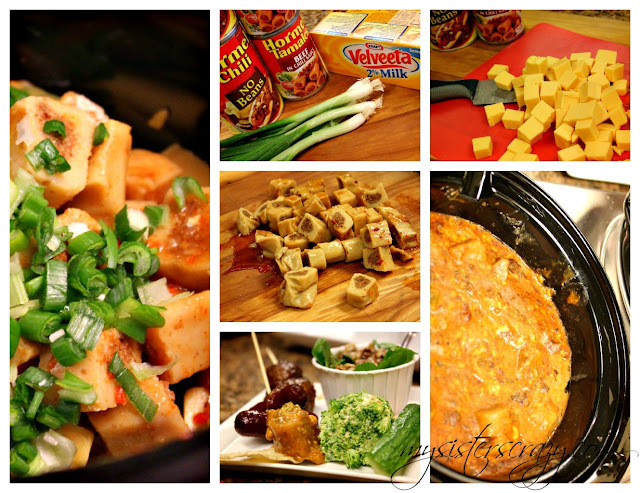 Tamale Dip...we love it! Easy, easy to put together...just takes a few minutes. You can use any type of tamale. This one is made with canned tamales cuz I don't have fresh ones but it is still fantastic! Serve this with tortilla chips. I also am serving a spinach and artichoke dip that is good with tortilla chips. This way I there are two dips for the chips. Making it as easy as possible on myself! This dip is always gone, I never have leftovers! If you eat green veggies on the New Year it is suppose to symbolize a year of wealth. So, lets make 2013 a prosperous year and everyone eat your leafy greens! I have two fantastic mini salad options planned for the evening. My mother makes a Spinach and pear salad during the winter months. I would like to name it the "Good Luck Greens Salad" I feel lucky this year! This salad is usually served with large slices of pears. I want to serve this salad in tiny cups so I have turned this spinach salad into a chopped salad. It serves beautifully. I love the way it looks. Everything is funner to eat with a tiny fork. I have also made a spicy salad cheese ball. YU-UM! A salad Cheese ball? Just trust me, it is glorious! I always enjoy a good cheese ball but, this one is a little different. Who knew a ball of veggies could be so life changing!?! It is loaded with veggies. It is like eating a glorified salad in one bite. They taste great plus, they are beautiful! I will be standing by these all night...I gotta get my veggies in for the New Year! It has been said (don't know who said it...just know "they" did.) that eating a round cake on New Year's Eve symbolizes: completion or coming full circle. Also, cake is considered to be an indulgence and therefore a stress reliever. If you want 2013 to start completely free of last years worries and have a stress free 2013...eat a bunt cake or at least a part of one! Gosh, if it was only that easy! My favorite bunt is chocolate, surprise! MIDNIGHT CHOCOLATE CAKE...it is a family favorite! My mom has made this cake for years and years. To be honest, I don’t even know where she got the recipe. I just know it is D-lish! I have the recipe engraved on my heart. I am not guaranteeing that this cake will complete 2012 for you or cause your up and coming one to be stress free...I am guaranteeing, however, that this cake is moist and delicious beyond words! Did I mention it is crazy easy. NO FROSTING! It doesn't need it. This bunt may not complete my 2012 but it's definitely going to complete my New Year's Eve menu. I will make one big bunt for presentation purposes and trays of tiny bunts for my guests. So, there are those guests that like a little frosting(or a lot)...I know who you are and I love you enough to make cupcakes with frosting. Cupcakes are round...they should go right along with "the eat round cake on New Years", right!?! This way you can have your frosting and eat it too. I want your year to be complete and stress free just as much as the others. I put gold flakes on top...YES, they are the type you can eat. When taking a bunt cake from the oven immediately cover it with a clean dish cloth and evenly press down. Don't be afraid, the cake is going to be fine! Be advised...it will be hot! This helps even out the cake so it will sit nice and flat. This same technique can be used for the tiny bunts too! They will sit nice and pretty. Want easy? Just short of opening a bag of cookies this next trick is just about as easy as it gets. Salted Caramel Popcorn. The sweet sticky caramel is set off perfectly by a light sprinkling of coarsely ground salt. It satisfies both my sweet and salty needs. The bonus to this treat...it is golden! It matches the color scheme perfectly. I love a treat that can be made in 5 minutes! I will serve several trays of individual sized cups of caramel corn and filling jars with the extra. The jars will look great on the serving table. I love this recipe because you can use microwave popcorn. If I am feeling especially zippy I can also pop corn on the stove. What ever I have on hand...it works! Three bags of microwave popcorn works perfectly! There is a bonus to microwave, no cleaning a pan. Now one likes to bite into a popcorn seed when eating soft chewy caramel corn. Make sure to remove the grannies! The evening will be great we have a fire pit to roast giant marshmallows, there will be music, toasting, kissing, noise making, party hat wearing. There will be lots of tiny salad eating, mini meat ball picking, and chip dipping. All of that AND I will be safely at home and not have to fight a crowd or drive on the crazy roads! I will Just have to do dishes! SHOOT! 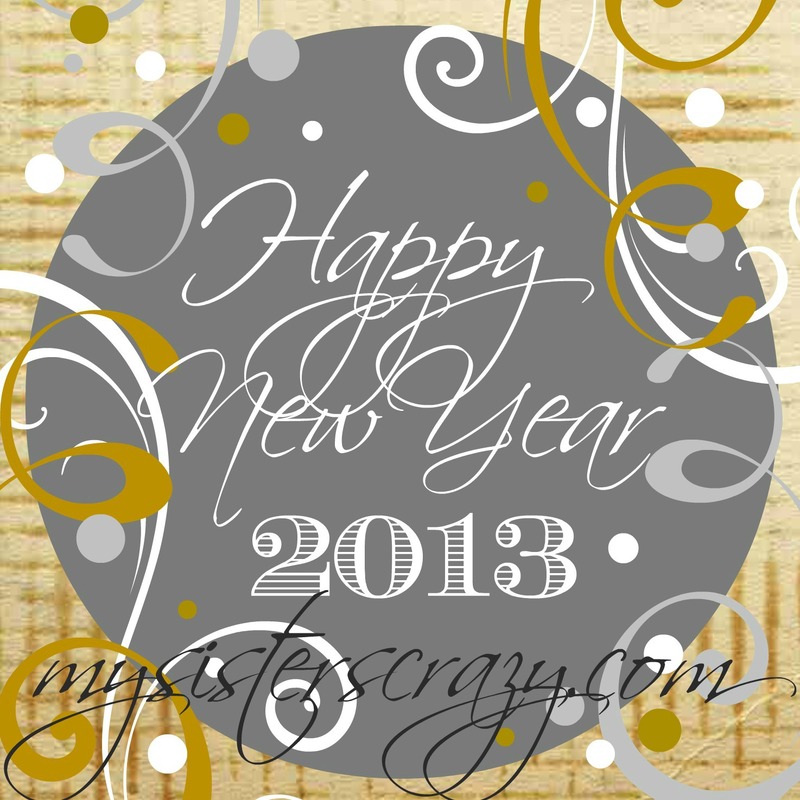 2012 ends with a party and 2013 begins with a party. I don't know who I need to thank for that calendering genius... who ever you are...you have my utmost respect. I can't think of a better situation. So I say...let the preparation begin and party on! Basically, December is a month long party around here. I am not even mad about that, in fact, I rather enjoy it. 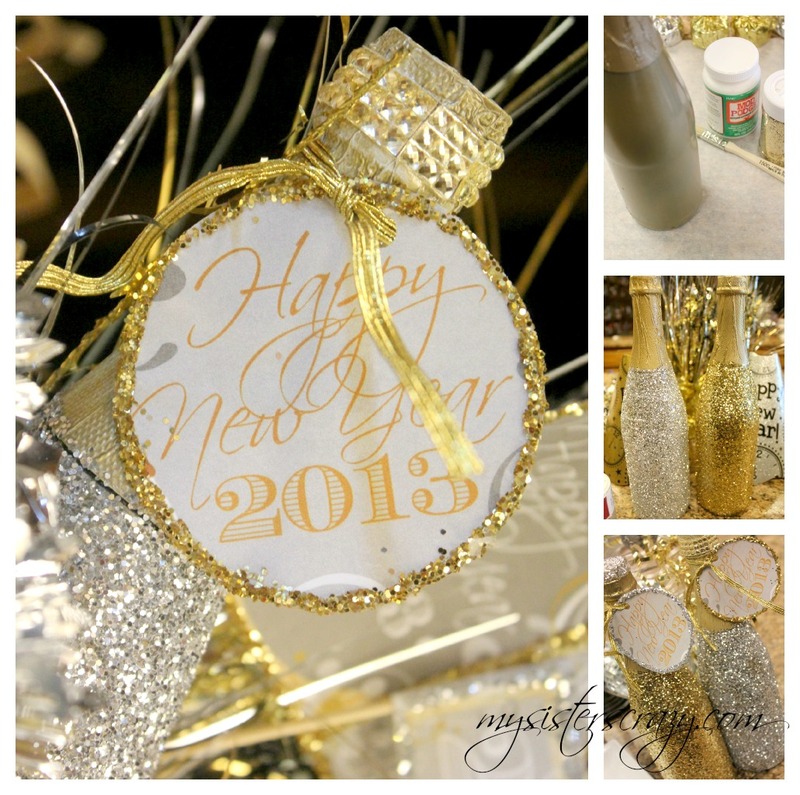 2013 will begin my favorite way…glitter! I made a quick trip to the dollar store AS I am always want to do. Once home I made a few simple changes to the already fantastic items and well…basically we are ready to party. All of my decorating is done, I will think about what I am going to serve tomorrow. But, as for now...It looks so shiny! I digitally made and printed a few simple things on the computer, gave them a little glue, and glitter...BAM!..it is a party! I didn't want to dedicate much time to a banner...I just made a shorty with the numbers of the new year. It is hung between two wreath hangers. 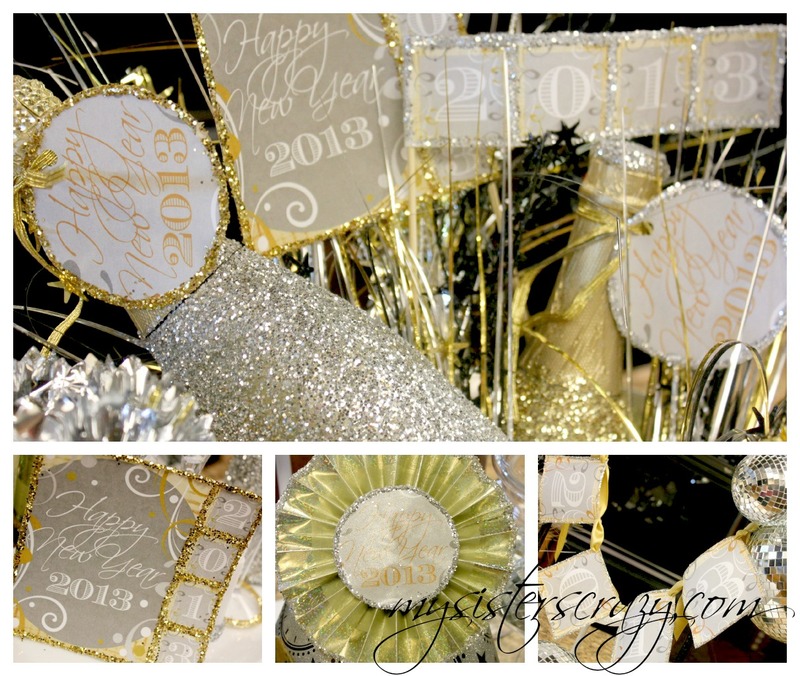 The wreath hangers are strong enough to hold this New Year's swag and a couple of disco balls! This glitter hat has been embellished and hangs from the other wreath hanger top. These simple glitter hats were a dollar. I loved them. I made a few a little fancier for my serving table. Tinsel and a recycled Christmas stick on bow to really spices this guy up. I received several bottled beverages from my neighbors and friends this year for Christmas. I pretty much horded them for just this occasion. 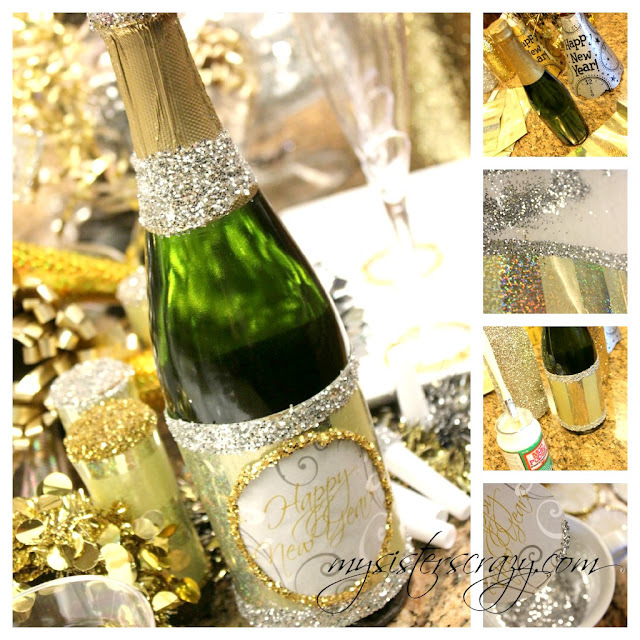 I Modge Podged glitter to the bottles with the "Outdoor" Modge Podge. The bottle says this product will allow me to put what ever I have covered outside and it will be protected from the elements. I am trying this because I figure the glittered bottle should be able to withstand sitting in an ice bucket. We will see!?! I also recycled Christmas gold wrapping paper. It is wrapped around the belly of this bottle. I like the way this guy looks too. 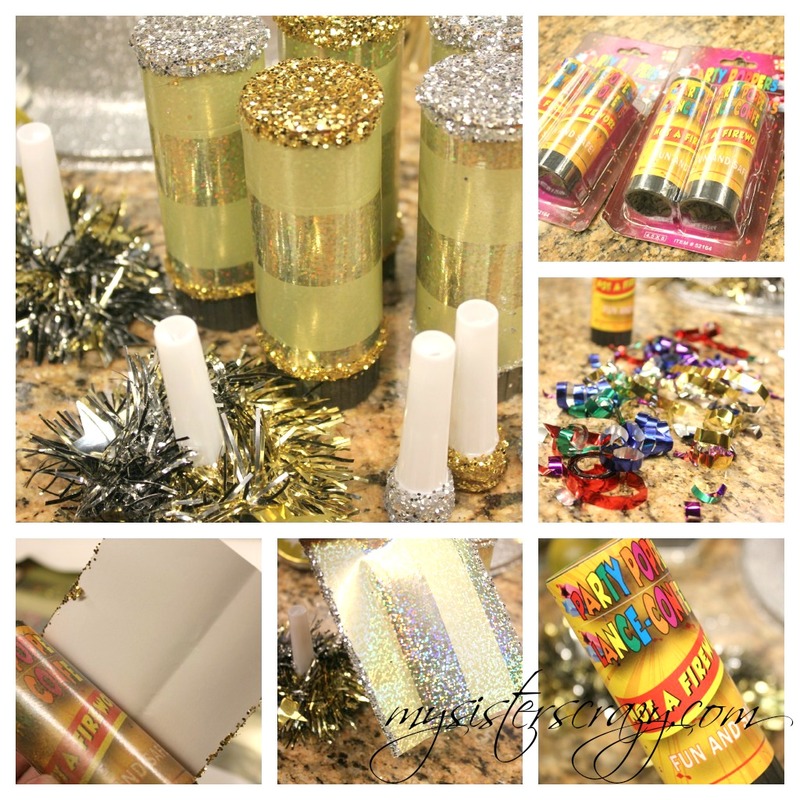 This is a quick and easy New Years Eve craft project that makes a big difference! It uses far less glitter than you think...go for it! What is New Year's Eve without a little noise making? We always do our partying with the family so there is plenty of noise VIA the "Little's." However, I did get several fun things that are sure to please my tiniest of New Year's Eve guests. 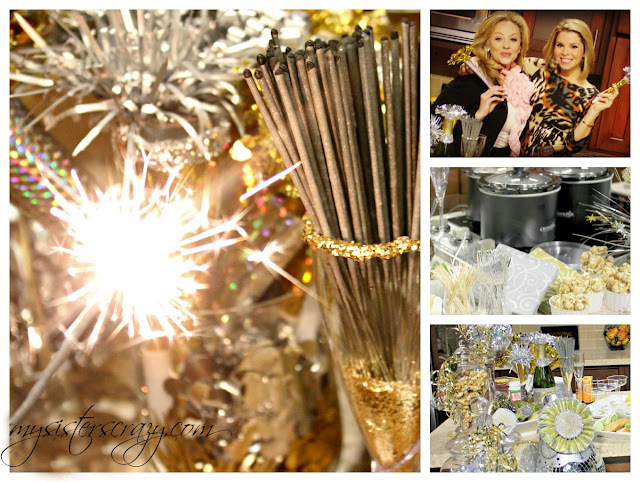 If you haven't noticed yet...my New Year's Eve Party is strictly following a gold and silver theme. I think this is not only beautiful and classic...AND, there is so much in the stores right after Christmas in these colors. There is lots of shiny items in these colors in the clearance section. I try to take advantage of that isle all I can. Re-purposed Christmas wrapping paper and "stick on" bows to are a great way to cheaply decorate. The horns came 6 for a dollar. I unwrapped those pre-made sticky bows and glued it to the edges. I found really fancy horns like these in Party City only those fancy horns are like 4 bucks a piece. With a little hot glue and about 20 minutes I made 20 for $4.00. For some twisted reason I really get a high off of that!?! Who knows? The packages of horns I bought had mixed colors...usually red is a favorite... there is just no room at this particular party for red this year. Anything that was not in my color scheme...got covered in paper or glittered. YUP...I totally ripped off the red horn part and glued tinsel and glitter around the noise maker part. I am not ashamed of my craziness. These next little babies are fantastic. If you buy them at Party City you get 3 for $4.99. However, being the super cheap party shopper that I am...I found them 2 for $1.00. Love them even more now. If you were not crazy, you would just open them up and put them in a bowl for your guests...I however, can't stand that they will not follow my color scheme. ARRRGG! No worries! They wrap nicely in recycled Christmas paper...A little glitter on top and they are perfect. 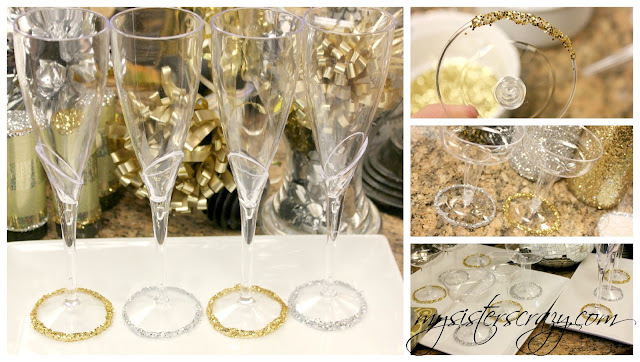 I made a simple change to disposable champagne glasses. I added hot glue to the base rim and dipped them in glitter. It is the little things that make me so happy! I always use glass jars as filler on a serving table. I can't help it, I love the way they look. I found tons of disco ball looking ornaments in the after Christmas sales. For some reason they were completely overlooked in many of the craft stores during the holiday rush. However, these little mirrored ornaments make adorable mini disco balls. Hobby Lobby had stacks of these shiny guys. They were so cheap...I had to! They filled the jars nicely. I also used those little "egg" looking shiny ribbon balls...You know the type... They are super cheap to begin with but in the after Christmas sales they were like a quarter. I didn't even have to curly them. I just unraveled them and tied a big messy bunch on. 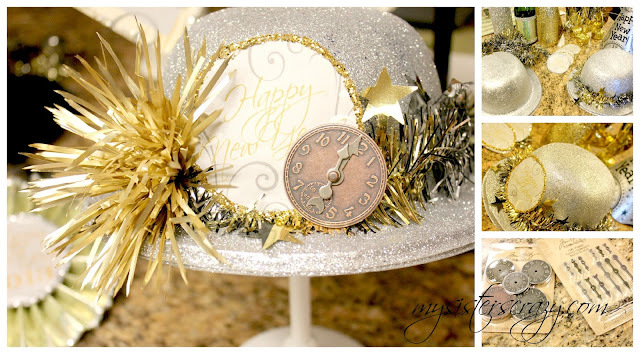 I also found tiny clock faces at Joann's they made great little accents for my New Year's Eve jars. 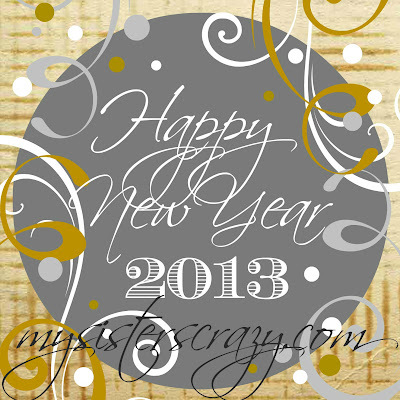 I made several different digital New Year's Eve printouts. I basically cut them out, hot glued the edges (Ain't nobody got time for regular glue) and glittered them. 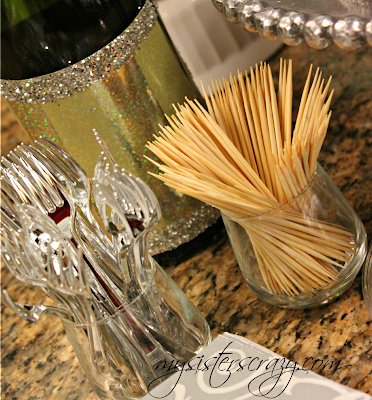 I put them everywhere...Jars, party hats, a swag, bottle tops, and little picks. I wanted some of them to be round shaped so I cut out the big circle in the center of the tags. They are very versatile. Lets get serious for a moment...I did no laundry, my floor is covered in glitter, and we will be buying dinner. I do no exercising on these days, wore no makeup, and my Christmas tree is still up! However, my 5 year old daughter and I had a great time glittering today! We had an action packed weekend! My crazy sister (right), mother(middle), and I(left) spent several days in the kitchen preparing for a couple of exciting parties that just so happen to all fall this weekend. I am so tired!! !...BUT, we had a great time. We work well together and I enjoy the time I get to spend with them. My mother is the originator of all things “over the top”. If a little bit will do…a whole lot Is better! I am crazy about certain details because of the lovely mother I have been blessed with. She has spend the better part of the last 40 years entertaining everyone she loves. 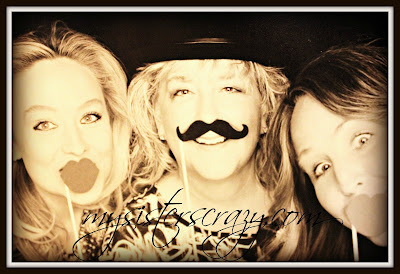 Her love of fun and family has taught me a treasure trove of valuable secrets. She would let us help her in the kitchen and prepare for her parties. I love her for the exposure to her art of entertaining. She is why is am crazy. Truly this CRAZY didn’t fall far from the tree! There are so many layers of preparation to this weekend..we shall begin with the table. 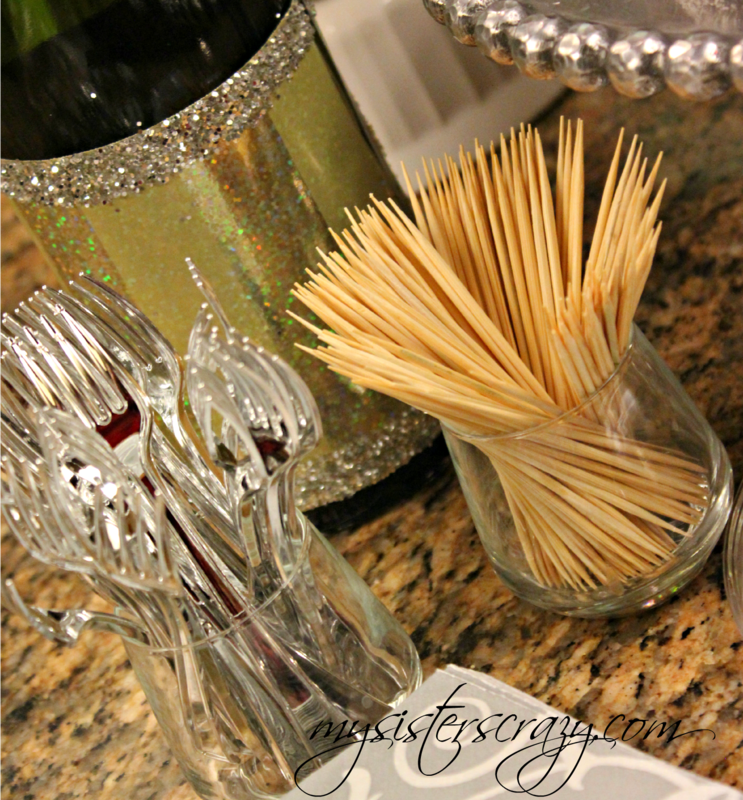 Simple bows on the chairs, filled glass jars, and no table cloth. 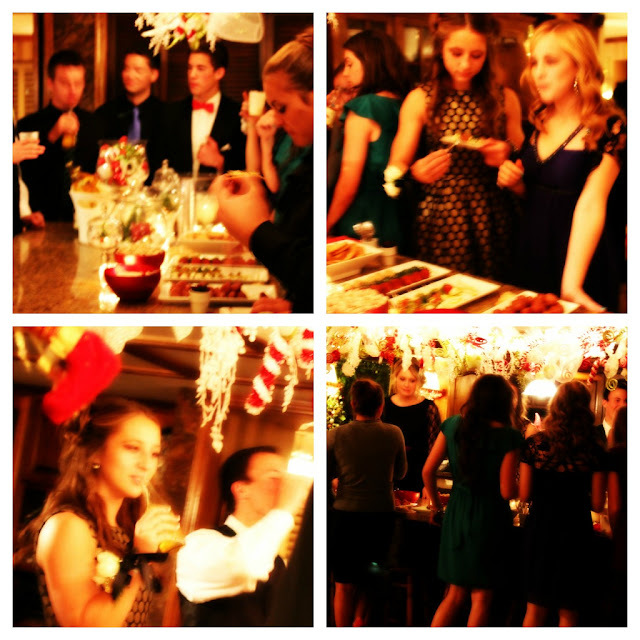 This party was for a group of teenager going to a Christmas Formal Dance. They came to the house for dinner instead of going out to eat. We didn't want to add too much by way of table cloth because the girls would be in formal dresses. Sometimes a table cloth really gets in the way of a formal dress! We had to move the coaches in the adjoining room and bring in another tale. It worked well. Every party should begin with eggnog! This is the same recipe that I used in an earlier post...actually...it is the only "Nog" recipe we ever use! DELISH! We also had bottles of sparkling apple juice for those who don't like eggnog. I am sorry to say there are those who do not see the extraordinary beauty in "Nog"...SAD!!! Cheese Balls are a fantastic way to "appetize" your friends and family. We like to do three different recipes. Each is rolled in a different topping... the red, green, and white effect of these tiny balls is super merry! I have not met a cheese ball I have not liked, but these little guys are to die for. They are rolled bite size...perfect for a cracker! They can be prepared several days ahead...LOVE! A cheese ball is a superior appetizer by far! CLICK HERE TO SUBSCRIBE TO MY CRAZY AND GET THE CHEESE BALL RECIPE!!! I would like to personally thank the appetizer "Caprese". not only are you beautiful,easy, and yummy...our colors lend themselves to the season! A Caprese is a simple salad of sorts. It consists of Mozzarella cheese, tomato, and basil. Typically it is served with olive oil and balsamic vinegar. Here we are serving it on skewers. Instead of the traditional dressing, we have drizzled pesto on the little guys! What can I say..we are a fan of pesto! Who doesn't love a meat ball? RIGHT!?! I have to admit the meat balls are always the biggest crowd pleasers. Never a single one left! The kids had a great time standing around talking,eating, and laughing. It was a great start to any Christmas Dinner. 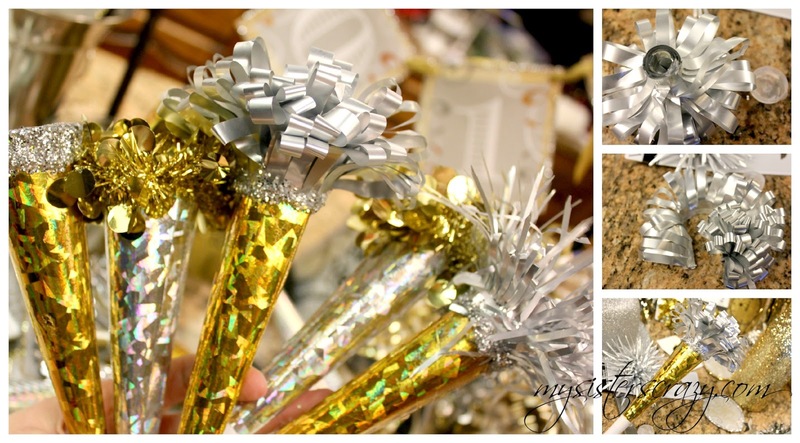 These would be easy appetizers for a New Year"s Eve party! 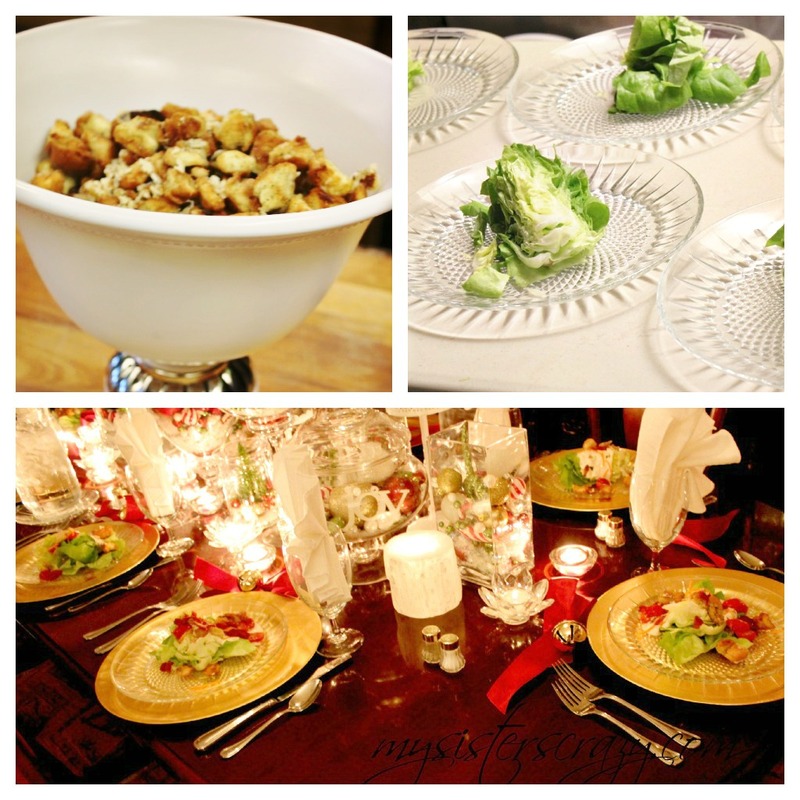 While they were mingling we prepared a wedge salad for each plate. The best part of the wedge salad is the homemade ranch dressing and croutons. It is a recipe my mother got from her mother. It is killer ranch..seriously, don't buy it...make it! The croutons...I can't say enough about them...no salad necessary...they are dangerously good! This is a beautiful and easy to prepare salad...no chopping! After we had the salads in place we called our guests in. They love the salad and were delighted by the table. I love when it works! Salads were followed up by "glass ringing". I love a teenage group...so self entertaining! While the ringing continued...finished loading up their plates. During the salad we grilled stakes. My mother has a fantastic stake marinade that quite honestly is to die for. We made sour cream and buttermilk twice baked potatoes, rolls, and creamed corn. What the plate lacked in color it made up in flavor. The highest level of deliciousness. This was such a hit we will be serving a similar Christmas Eve Dinner. 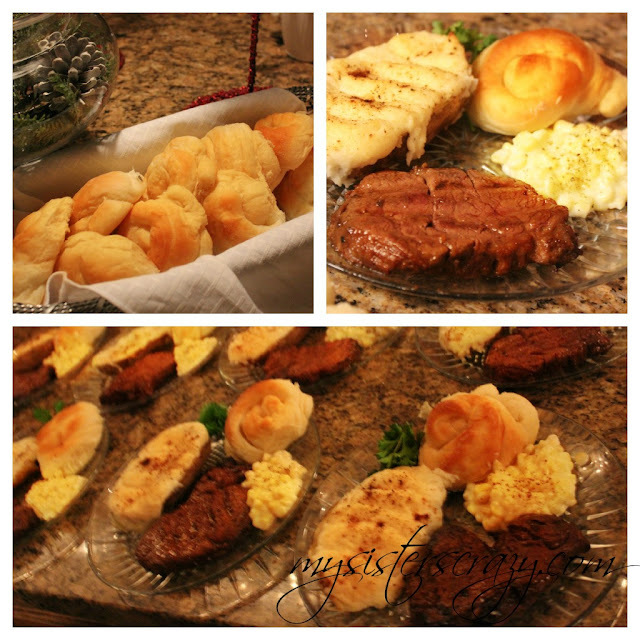 Nothing is better than a great cut of meat, homemade roll and a perfect potato! NOTHING! Last, but certainly not least...DESSERT! A lot o care went into this tiny quad of tasty treats! The nice part is all the work was done the day before these are all items that are actually better the next day.We served an Oreo and cream cheese cake pop (easiest easy), a rice pudding with topped with cream and a candied cinnamon sprinkle, red velvet cake shots with layers of fluffy filling, and a tiny hot chocolate! The perfect ending to a great meal! Each tiny dessert tooks it's place on a perfect little plate....this dessert was screaming tiny little screams to be eaten! HOW CUTE!!!!! It was a good moment. We lined the plates up on the counter and loaded them up. When you are serving a sit down dinner this is the easiest way to load up the plates!